Janet Louise Yellen (b. 1946) was born to a Jewish family of Polish descent in Brooklyn. Though initially interested in studying math, science, and philosophy, she ended up majoring in economics, and eventually earned a Ph.D in economics from Yale. She went on to teach economics at Harvard, The London School of Economics and Political Science, and UC Berkeley. In 1997, Yellen chaired President Clinton’s Council of Economics Advisers. Between 2004 and 2010 she was president and CEO of the Federal Reserve Bank of San Francisco, and following that, the vice-chair of the US Federal Reserve. Last year, she became the Fed’s chairwoman, the first woman in history to hold that position. Yellen has been described as a “dove” in economics, focusing on relieving unemployment and keeping inflation in check. 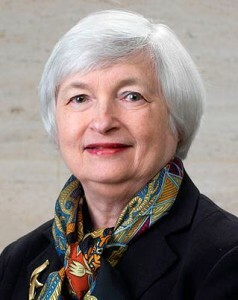 She has been hailed for redefining the Federal Reserve, and has stated her objective as helping “Main Street, not Wall Street”. In 2014, Forbes ranked her the second most powerful woman in the world, and more recently the 6th most powerful person on the planet. In this world there is no beauty without ugliness, no joy without sorrow, no pleasure without pain. You cannot invent a thing that will provide benefit without threat of harm. Neither is there a human on this earth who does only good without fault… Therefore, do not reject any thing for the harm it may render, nor despise any man for the ugliness you find within him. Rather, use each thing towards the purpose for which God conceived it, and learn from each person all the good they have to offer. This entry was posted in Business & Finance and tagged American Jews, Bank, Brooklyn, Clinton, Economics, Federal Reserve, Forbes, Harvard, London School of Economics, Most Powerful, Polish Jews, Professor, San Francisco, Yale on August 4, 2015 by Jew of the Week.